ActivityView provides everyone with one complete overview of the day’s meeting activities and improves your meeting room efficiency instantly. 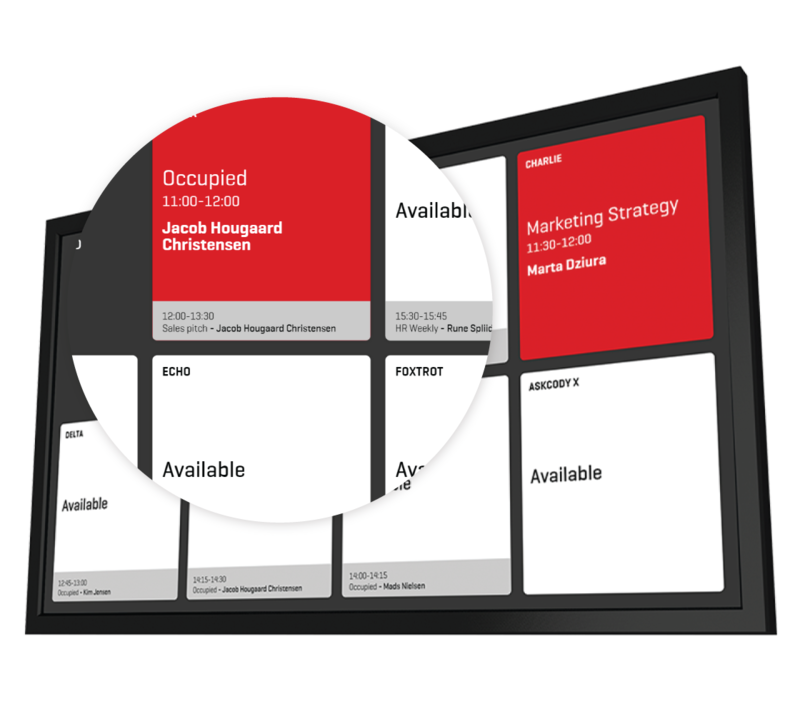 Run and display ActivityView in any high-traffic areas like the reception, the office entrance, or meeting room clusters, so everyone knows where the nearest free room is right now, giving people a powerful summary of the office schedule, in real-time, connected and integrated with Outlook, Office 365 and G-suite. ActivityView makes all information about current and upcoming events available for users and visitors and displays when the events begin. The instant overview frees up front desk resources and fosters a modern, premium office environment. The difficulty in finding unoccupied meeting rooms, interruptions in the middle of meetings, and booking misunderstandings are often due to confusing processes, unintegrated and unsynchronized systems, and cumbersome technologies. ActivityView from AskCody answer scheduling questions before they are even asked and makes it easy for your daily users and visitors to get an overview of the days' events and meeting activities. - Room view provides you with an instant overview of up to 6 meeting rooms (2 meetings at each room) and availability of the meeting room. Shows the availability by color coding green when available and red when occupied. - List view shows all meeting activities for all meeting rooms in a dynamic list which is updated instantly. Think of the departure screen in the airport, but for meetings and events. - Tile view gives your 7 tiles per screen with information about 7 rooms. You can see availability, and information about the current and the upcoming event for each room. Tile view is excellent if you want to combine more screens and make a display wall with 20 or more rooms. Can I Customize My Company's Meeting Room Displays? The design of AskCody Meeting Room Displays can be designed to reflect your company profile. Displays can be mounted in both portrait and landscape mode. How are Today+ and ActivityView different? ActivityView is a large-scale display product intended for lobbies, foyers, and larger meeting room displays. ActivityView isn't interactive. Today+ is a small scale meeting room display product intended for iPad sized meeting room displays. It is interactive, allowing meeting booking and equipment failure reporting. Our software is web-based and more or less only require a stable internet connection. You can use the chat widget, ask our support staff or contact a sales rep about setting up a proof of concept to test the display hardware you already own. How is the Meeting Room Display integrated with my Outlook or Google Suite? AskCody provides a solution with direct integration for Microsoft Outlook and Microsoft Exchange through Exchange Web Services. When booking and scheduling meeting activities in Exchange and Outlook, the meetings and events are always visible and updated across all the solutions from AskCody. Similarly, activities are created and updated in Exchange when activities are booked on the Today+ digital door signs. This includes current meeting information, attendees, description, the status of the room, and upcoming events resulting in more efficient utilization of your resources. On the digital signage solutions, current meeting information, the status of the room, and upcoming events are displayed and always visible which instantly improves your meeting room efficiency. Our integrations for calendar systems from Microsoft are available for Exchange 2007, 2010, 2013, 2016, and Office 365. All communication between the AskCody web server and your Google Account is web-based through the Google Calendar API. The Calendar API lets you display, create, and modify calendar events as well as work with many other calendar-related objects, such as calendars or access controls, and is built-in to the AskCody Platform. The integration is managed in the AskCody management portal. ActivityView can be designed to reflect your company profile, and the content can be displayed in both portrait and landscape mode. It can display all event details including start time and location. This makes it easy for your daily users and visitors to get an overview of all of the today’s activities and meeting room availability in a single glance and makes it easy to find the event or meeting they are attending. 12 rooms in portrait mode (two meetings in each room). Availability is color-coded: green for vacant and red for occupied. TileView delivers a list of up to eight tiles, providing you with information about availability and events. This works great for larger areas more two or more screens since more rooms can then be displayed. ListView displays all meeting room activities in a dynamic list which is updated instantly. Think of it as the displays with departures at the airport. Can the Meeting Room Display show my personal calendar? It is easy to use Today+ and ActivityView for a personal calendar. With ActivityView for personal calendars, you can take control of your time and easily let co-workers know if you’re free or busy. Hereby avoiding daily distractions and unwanted interruptions. ActivityView for People will let your colleagues know when you're in a meeting, busy with a deadline, out of office or free to chat. With this, you can effectively manage the time you need to complete tasks and collaborate with others. Let your co-workers know what you're working on right now so that they can easily see if/when you are available. Do you know how to get more out of your meeting rooms instantly? 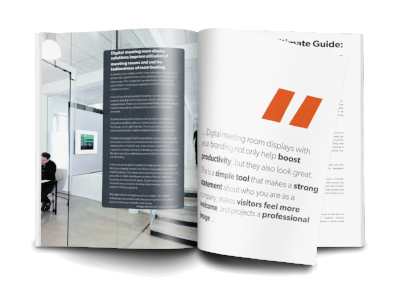 Download the eBook to improve utilization of the meeting rooms and end the tediousness of room booking.